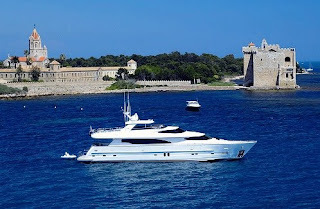 Annabel II is a 2009 Horizon 97' luxury motor yacht. A modern Horizon luxury motor yacht, she boasts contemporary styling and performance as well as lovely woodwork and craftsmanship throughout. With four large cabins with en suite heads forward, a huge country kitchen and galley, and a beautiful formal dining area. Annabel II boasts the latest Bose sound entertainment systems, 9 TVs, CDs, a Jacuzzi pool and a tender with 80hp outboard.